When you own a home, a major priority should be to have a roof inspection regularly to resolve the minor issues found before they become major issues. Some roofing problems are more evident than others, like a storm ripping shingles off the rooftop or gutters being destroyed by a ladder. Alternatively, some issues require closer attention to determine if more work is necessary. Some issues are detected quickly, while others stand in need of focused attention. Fortunately, most problems mentioned below are quickly detected and easily remedied with an experienced roofer. Regardless of the extent of the damages, a roofer can effectively resolve the problem by offering professional roof service to maintain the integrity of your roof. Whether you find missing and damaged shingles, a leaking roof or severe structural damage, our professional roofing team will take care of the problem immediately. Damages From Wind and Storms – Roofing materials can be quickly damaged by high winds. In some cases, winds can blow the roofing materials right off the house. More than likely, blow-off damages develop in a specific section of the roof or on the side receiving high winds. At a high rate, winds easily tear off roofing felt and sheathing. To repair this, a roofer would install new roofing materials while making sure the roof offers protection from a future storm. Major Roof Damages – Major storms and high winds can cause entire trees and large limbs to fall on top of your roof. Consequently, the major impact of trees and limbs hitting the roof can result in small holes occurring on the rooftop to the entire roof collapsing. Based on the extent of the damages, a total roof repair may be necessary. Shingle Damage – Wood and asphalt shingles may show indications of damage from simply wearing out. Alternatively, there are other reasons damages occur. Torn, ripped, broken and missing shingles are often the result of severe impact, high winds and foot traffic. Once aged, shingles curl up and break apart. Replacement shingles are necessary when they become brittle. When shingles bald, they lose the important granules that protect the roof. The balding results in premature aging of the shingles when exposed to the hot sun. When the roof is inspected, roofers look for any nails popping up into the shingles. These often cause small leaks in the roof. In some cases, replacing a few shingles works, but in other cases, the entire roof may require replacement. A roofing expert can examine the roof and inform you of the best course to take depending on the damages. Leaks in Roofing – Unless a huge tree limb slams through the roof, detecting leaks can be tough. Water can easily run right by the roofing materials through a tiny hole that began through a popped nail. Next, it begins leaking around impaired flashing directly into your house. In some cases, the water gets backed up behind an ice dam and leaks into the house. The location where the leaking is found inside your home may be nowhere close to the true location of the leak. When you find leaking inside the house, calling a roofing expert is a wise decision. The roofing expert will examine the roof, chimney and vents for flashing cracks, inspect the eaves to see if there are ice dams causing damage, visually scan the roof for shingle damages, and inspect the attic to see if there is further leaking. Roof Flashing – Flashing is designed to prohibit water from the roofing materials in order to keep moisture damages from occurring. If flashing is damaged, it should be replaced during a roofing repair in order to function correctly. Roof flashing should always be checked out during an inspection to identify any damages that need correcting. 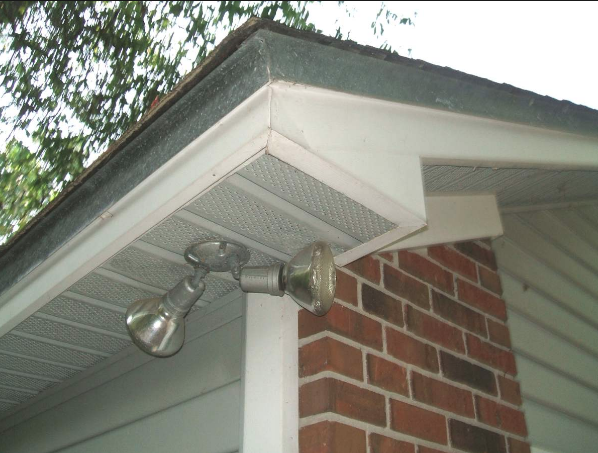 Downspouts and Gutters – Mold, moisture and water damage in basements is easily avoided by managing the roof runoff. It is very important that downspouts and gutters are in good working condition. Damages often found on gutters and downspouts range from bends, crushed sections, scrapes and small dents. Gutters can easily loosen from the rafters and fascia boards if weak. Rotted wood on the home can weaken the wood leading to loosening. During the inspection process, a roofing expert will clean out any debris, leaves and other objects clogging the gutters and downspouts. They also replace any damaged gutters. Broken Skylights – Damages often occur to skylights from hail, tree limbs, and other windblown items. This causes leaking inside the home. In many instances, broken or cracked glass panels are replaceable. If not, a roofing expert can install a new skylight. Roofing Ventilation Problems – Roofing vents can be an open invitation for outside animals and insects to get in when not correctly screened. Some vents have insufficient ventilation, requiring new vent installation. If the openings of vents are clogged or obstructed, the result is leaking. A roofing expert can diagnose and repair these issues or replace them with new vents. Rotting Wood – Wood rot occurs when wood cannot dry out completely once wet. The tiniest leaks can result in rotting rafters and roof wood sheathing. This critically damages the structure of the roof. A weak roof is not a safe roof! Additionally, the soffit and facia boards are susceptible to rotting. If a roofing expert inspects the roof and discovers dry rot, they can patch it with new materials or replace the rotting wood. Roofing Layers – Generally, when a new roof is installed on a house, the old shingled roofing material is removed. In some cases, the old roofing may have stayed in place and new roofing installed on top of it. Most of the building codes today will not allow that to happen, but if it happened in the past, you end up with a layered roof. Consequently, layered roofing results in numerous problems. First, the top roofing shingles are likely to be ineffectively anchored on the sheathing and uneven. Next, the shared weight caused by the combination of shingles can be too much for the roof framing. A resolution to this is removing all layers and starting all over with fresh roofing on the sheathing. As a homeowner, diligent roof maintenance can save you a lot of money. Our professional roofing team can quickly identify potential problems and come up with a fix before they become major problems.